Foster critical thinking and visual literacy in the Art Appreciation course. A World of Art fosters the critical thinking and visual literacy skills students need to understand art from around the globe. Noted author and educator Henry Sayre teaches students how to ask the right questions about the visual world that surrounds us, and to then respond meaningfully to the complexity of that world. New to the eighth edition, seven thematic chapters help students better identify and understand major themes of art—such as “the cycle of life” and “the body, gender, and identity”—that transcend different eras and regions. MyArtsLab for the Art Appreciation course extends learning online to engage students and improve results. Media resources with assignments bring concepts to life, and offer students opportunities to practice applying what they’ve learned. Please note: this version of MyArtsLab does not include an eText. 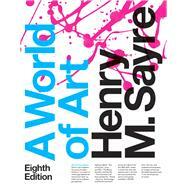 A World of Art, Eighth Edition is also available via REVEL™, an immersive learning experience designed for the way today's students read, think, and learn. Henry M. Sayre is Distinguished Professor of Art History at Oregon State University—Cascades Campus in Bend, Oregon. He is producer and creator of the 10-part television series A World of Art: Works in Progress, which aired on PBS in the fall of 1997; and author of seven books, including The Humanities; Writing About Art; The Visual Text of William Carlos Williams; The Object of Performance: The American Avant-Garde since 1970; and an art history book for children, Cave Paintings to Picasso.